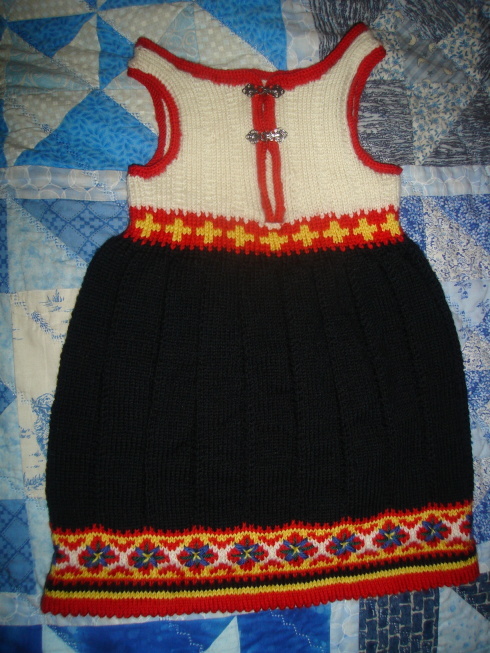 I’ve finished the little dress from the Dale book, and it turned out soooo cute!! I’m really pleased with it. I bought some little pewter clasps online to use as buttons. The shower is next Saturday, so it’s pretty good timing. I’ve started the next project. I was originally going to do one of the sweaters as a cardigan and the other as a pullover (the pattern has instructions for both), but before I started I read through the cardigan pattern and saw that it’s knitted in the round and then steeked. I’ve never done steeking before, and while I do want to try it, I figured a gift item wasn’t the best test piece, so I’m going to do two pullovers instead and save steeking for another day. I’d be twice as far along, only I realized a couple of rows below this that I’d mis-read the pattern and was starting the rows in the colour-work graph at the wrong place (I’d started the first one in the right place, but then was going to the far right at the beginning of each new row, instead of back to the same starting place), so I frogged it and started over. Much better now. 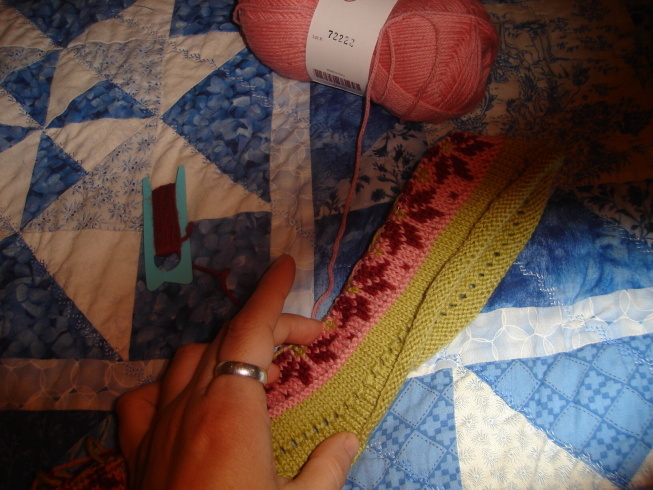 The one thing I don’t like about this pattern so far, is that there are a couple of rows that involve three colours of yarn. It’s orders of magnitude tanglier than just two. Recently watched the new-ish version of Sense and Sensibility (I think it was part of that Austen series they showed on Masterpiece a year or so ago, but I missed it then). I really liked it. Well enough to buy a copy for my library. None of the others in the series impressed me that much, and I will keep faithful to the earlier versions I already own (P&P w/ Colin Firth and Jennifer Ehle, Persuasion w/ Ciaran Hinds and Amanda Root). Not to say I no longer like the Emma Thompson version of S&S, though. Author kruthie73Posted on Sunday, 4 April, 2010 Friday, 11 February, 2011 Categories audiobooks, knitting, movies, pics, theatre4 Comments on So cute! So I went to see Star Trek this weekend and I must say I enjoyed it. I liked the choices they made with the various actors; Karl Urban seemed to be channeling DeForest Kelley’s McCoy, which was fine for McCoy (he’s such a specific character), but I was glad the other actors did their own takes on the characters. I liked Scotty a lot (“Are you from the future? That’s brilliant! Do they still have sandwiches there?”); I found his accent to be more authentic than James Doohan’s – he tended to do a more stereotypical accent. I was a little weirded out by the Spock/Uhura thing, and I didn’t even realize that Winona Ryder played Spock’s mother till I got home and looked it up. Chekov was adorable, and seemed much more competent than in the original series. As far as the plot went, I’ll bypass the fact that they used time travel as the main plot device (they comment in the film that this is cheating). I can suspend my disbelief enough to accept that Spock and Nero ended up 154 years in the past, but what really bothered me is that the way they got to the past was by passing through a black hole. I mean, isn’t the point of a black hole that the gravitational forces in them are so great that nothing can escape?? I mean, putting aside the passing through it, even if they could, shouldn’t the ships have broken up completely, or been crushed to teeny, tiny, dense lumps? For the rest, there were quite a few things that made me giggle, a fair few in-jokes for the fans of the series and movies, and enough explosions to satisfy the most rabid mythbusters fan. I’ve recently been watching the new(ish) series of Miss Marple stories that had been coming out on PBS a few months ago. I really, really like Geraldine McEwan in the title role. She’s almost exactly what I always pictured in my mind when I thought of Miss Marple when reading the books. I also came across a biopic of Agatha Christie told mostly by herself, from the perspective of her talking to a therapist after her disappearance/reappearance in 1926, and of interviews with journalists at the ten year anniversary of the opening of the Mousetrap. Over the weekend I also bought the new Stargate movie. It was fun… had a lot of great stuff that was reminiscent of earlier seasons. So, I ordered Unbreakable from Netflix, and when it came, the disc was broken. I had a giggle over the irony in that. They finally called me Wednesdy evening to offer me the job. The HR lady who likes me had told me to expect the call, and to pretend to be surprised. So I pretended, and needless to say, I accepted! I’ll be starting Monday week, but I still don’t really know what it’s going to involve… other than some amount of programming. I suppose they’ll get to that eventually. I went to see HP5 Tuesday night with some friends from the theatre. MB bought the tickets ahead of time, and at the last minute a couple of people had dropped out, so I invited Eileen to come along with us. It was pretty good, considering it was the shortest movie so far – and based on the second longest book. They left out ridiculous amounts of stuff, but what was there was good. In other news, I’m going to see The Complete Works of William Shakespeare (abridged) at the Hippodrome this Saturday. It’ll be the first time I get to see the Cachinnator act; Don Boscoe is also going to be in it, plus a third guy I don’t know. I’m going with MB… Sherry was up for it, but was going to be out of town that day. Also, we’re finally going to have our Music Man intervention this coming Tuesday. Huzzah! Author adminPosted on Friday, 13 July, 2007 Friday, 13 July, 2007 Categories movies, theatre, work2 Comments on Yesssssss!!! For a job, that is. I haven’t had a whole lot of luck, but I did have an interview here in the library Friday before last. They said that they hoped to have the rest of the interviews done by last Friday and make their decision some time this week. It’s now Thursday and I have yet to hear anything, so I’m starting to lose hope. Still, fingers crossed until I know for certain. I finally finished Tales from Shakespeare on LibriVox, which I’d been working on since March. I didn’t remember them being so dry and dull. The only way I got through was by bribing myself with reading a chapter in a new project every time I managed to finish one of the Tales. The two projects I bribed myself with were What Katy Did at School, which I’ve since finished, and Anne of Green Gables, which I’m about two thirds of the way through. I’m planning on doing another of the Scarlet Pimpernel books next; I’m leaning toward El Dorado, the one where they rescue the Dauphin. We had a SKVE meeting on Monday and watched How to Steal a Million with Audrey Hepburn and Peter O’Toole. So now we have several new quotes on our SKVE board. And let me just say that Peter O’Toole was hot back then! 🙂 We still need to have our SKVE Music Man intervention with Regan and Melissa, because we never did get our schedules worked out during Mattress, and they can’t keep going through life without having seen Music Man! I found out last night that Regan has never seen The Music Man! It came about because, when Lise was blocking Swamps of Home she was trying to explain that in a particular section of the song, she wanted us to look a bit like the women doing the Grecian Urns (one Grecian urn… two Grecian urns… and a fountain, trickle, trickle, trickle), and Regan didn’t have a clue what she was talking about! This from a… well, ok, she was never a music major, just an undecided music enthusiast, but she took lots of music classes, you’d think somewhere, someone would have introduced her to The Music Man! Well, if no one else will do it, I will. We’re having a movie night someday soon (just need to get our schedules sorted) so she can watch it. If Mary Beth and Sherry can make it too, we’ll make a SKVE night of it. We’ve been talking about asking Regan to join the SKVEs and this would be a good trial run, to see if she’s up to our particular brand of movie-watching. The last person we invited, Kelita, couldn’t seem to understand why we found it so amusing to MST3K our way through Pride and Prejudice (“look, I have a sword!”, “are you sure those are period sheep?”). Author adminPosted on Friday, 23 March, 2007 Categories friends, movies, theatre1 Comment on How is it possible?? Yeah, I’ve been watching Eddie Izzard again lately (“I’ve got legs. D’you like… bread? I’ve got a french loaf! WHACK Bye! I love you!”). I can’t help myself, the man’s a comic genius! I’m very proud of the fact that I’ve converted several of my friends to the Izzard… let’s call it cult, shall we? And speaking of friends, we’re going to get together in a couple of weeks (as soon as we all have a free evening, all at the same time) and have a Jane Austen night. Considering the number of Jane Austen films that have come out lately, it’ll probably be the first in a series of Jane Austen nights. Yay! I went to see Firewall yesterday… with one of my classes… and the professor paid. Now that’s what I call a field trip! The class is cyberwarfare, and basically, we went to see the movie so we could criticize… uh, critique it and the various technologies they use in it. It was fun, but it wasn’t really realistic… not that we expected it to be… it is a Harrison Ford movie, after all.